Commissioned in 1994 and completed in 1998, Anthony Gormley’s steel Angel of the North stands on a hill in Gateshead, Tyne and Wear, in England’s infamous North. 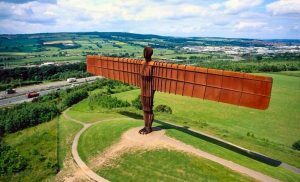 At 20 metres tall, with a wingspan of 54 metres, the Angel is an homage to the coal miners who worked for two hundred years beneath the site on which it stands. The Angel is based on a cast of Gormley’s own body, as with other pieces of his, and it’s wings are not straight. Instead, they are angled forward by 3.5 degrees; an attempt by Gormley to create, in his own words, a “sense of embrace”. Louise Bourgeois’ ode to the mother takes the rather powerful form of a large, metal spider. Standing at over 9 metres tall and over 10 metres wide, the piece was completed in 1999; the original sculpture was made from steel, though there have since been a further six castings in bronze, and the design even includes a sac containing 26 marble spider’s eggs. The association of the spider with motherhood may seem a strange one, but Bourgeois’ explanation of her decision is both poignant and pertinent. Bourgeois views spiders as “intelligent, patient, clean” protectors, much like mothers, and was inspired by the loss of her own mother to create a piece that reconciled these parallels. The only addition to the list that can be described as ‘minimalist’, Richard Serra’s 18 metre high nod to the beloved cartoon character Charlie Brown was unveiled in the year 2000 in the atrium of San Francisco’s GAP headquarters. When first put on display, the steel piece had sprinklers directed towards it to accelerate the oxidation process, which is why, today, it has it’s signature rusty colour. The long slabs are delicately curved, making for a subtle and touching complicity between the four of them.